Returning to our Heaven On Earth scenario: why can’t the government just print up a bunch of money and give it to people? Centuries of historical data shows that inflation inevitably results when governments do this. However, the Federal Reserve has pumped in almost $4 trillion dollars in the past seven years and no inflation has resulted. We saw that the Federal Reserve has been offsetting the lack of private spending, particularly the lack of savings that is devoted to investment. 1) Invest in Yesterday’s spending, or debt. This can be either our own debt or the debt of others. We might pay down a credit card balance we owe or a mortgage. We might buy a corporate or government bond. Savings, checking and money market accounts are an investment in debt. 1) the transfer of the replacement cost of the dwelling – yesterday’s spending adjusted for the change in price of the labor and material to build the home. 2) Someone else’s profit, and this is the key component of these two types of spending, yesterday and tomorrow. Whether buying a new home or existing home, we are buying the costs and profit of the builder or previous owner. 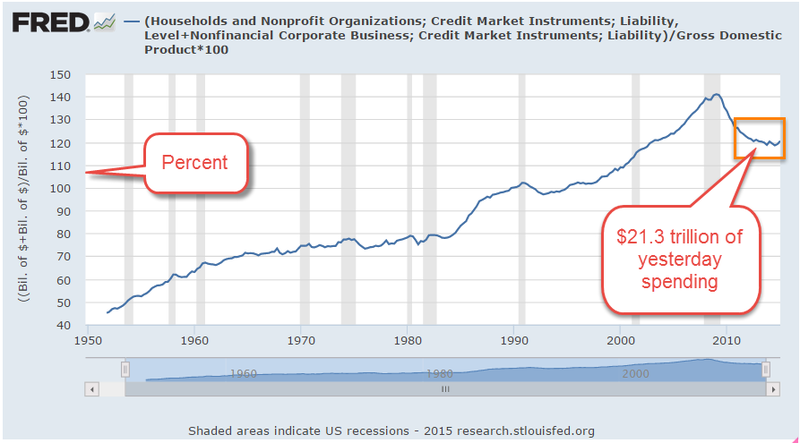 Below is a chart of household and business non-financial credit market debt as a percentage of GDP. From 1980 through the end of 1994, the SP500 index quadrupled from 110 to 470, an annual gain of a bit over 9.5% per year. In the mid-1990s, household and business debt started a steep climb to 140% of GDP by 2007 and this probably pulled in more savings to service that debt. In the next 15 years, the SP500 grew by only 233%. But wait! That’s not all! – as the late night commercials remind us. Governments at all levels borrow savings from private households and businesses. The current total is about $16 trillion. Adding the $16 trillion government debt to the non-fianncial debt of the private sector totals $37 trillion of yesterday’s spending that needs to be fed with today’s savings..
2) The other option for savings is to invest in equities – Tomorrow spending – and the profits generated from that spending. We might buy stocks, real estate or some other physical asset which will generate some production, a profit, or a capital gain from an appreciation in the value of that asset. The World Bank estimated the total market capitalization in the U.S. in 2012 at $18.7 trillion. Add on 33% or so since then to get an updated total of about $25 trillion. We could debate the valuation but it is clear that debt – investment in yesterday’s spending – is clearly winning the race against investment in the profits of tomorrow’s spending. If future growth looks modest it is because we are still in a defensive posture – weight on our back foot, so to speak. Low interest rates encourage investment in Tomorrow spending and the Federal Reserve has kept rates low to encourage us to lean in, to shift the weight, the energy of our investment from the past to the future.